First, be advised that all of these VCD's are IN CHINESE ONLY. In our opinion that doesn't matter much because the instruction is clear and the quality of photography very good. But we will not accept returns just because people didn't read... IN CHINESE ONLY. Given that, these are really tremendous deals for the money. Each of these special VCD's can be played on a computer for full enjoyment. Made for PC's they are also Mac compatible by downloading Quicktime (for free) and any similar VCD player program. Also playable on most DVD players. For less than $10.00? Wow! 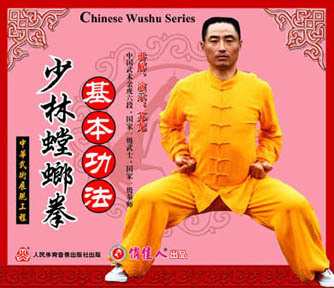 Created by Wang Lang over 300 years ago it is considered the last official style to have originated in the Shaolin Temple. 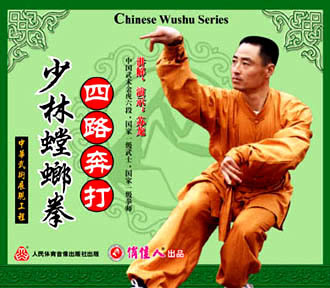 Mantis players harken back to original Kung Fu in that they often study and freely take from other branches of their art. 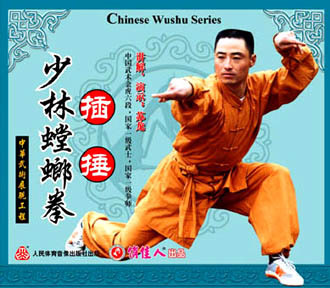 This makes Mantis one of the broadest and most successful styles of Kung Fu. 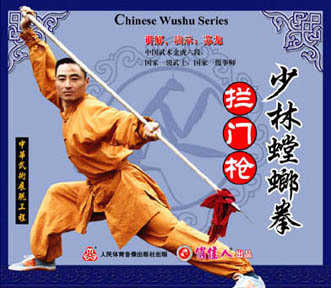 This branch of the Mantis, lesser known than most, keeps the Shaolin flavor as a component of its style. 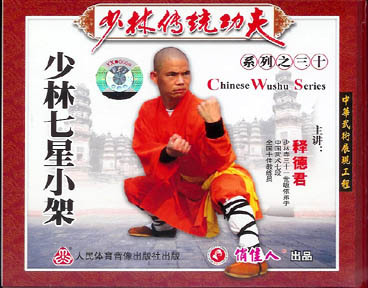 Seven Star Boxing is one of the classic Shaolin forms. 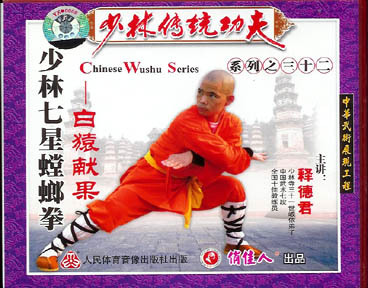 In this case it is the "small frame" version and we put it on the same page as "Shaolin Seven Star Mantis" for obvious historical reasons. This form displays very fast hands and mostly short movements. There are a number of section with multiple hand strikes off the same hand sans alternation. A quick and clean form. This form is a "running" set with very fast and fluid footwork and much emphasis on the "tiger stance." It features good fast hand combinations with agile and aggressive changes of height. a good, representative form of the Shaolin Mantis. Subtle angle changes and good hands. This set is a bit longer than some of the others. However there are more sections where certain motions are repeated somewhat like "line work" in a basics class. Strong moves intermixed with some fast combinations. Much flexible footwork. As many people know, Mantis was developed from the fusion of 17 (or 18) other style. 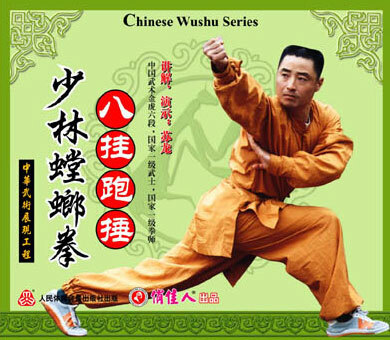 One of the key factors in the style is the Monkey Fist which is most apparent in the fast and nimble leg actions. Here, with the White Ape movements there are a number of Long Fist spreading actions intermixed with fast, tight combination. There is also a greater number of spear hand actions. Preying Mantis, which one could arguably designate as a Short Fist, actually came out of the Long Fist family (barring Southern Mantis of course). Even to this day most students are required to learn straight forward Long Fist forms such as Tan Tui in the early stages of their training. Then the proportions of Long Fist to the faster Mantis hands is just a matter of the mix. 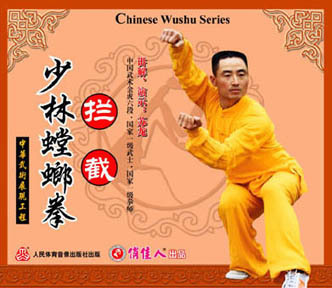 In this the Long Fist if at least half the form with a notable fusion of traditional Shaolin and the actions of the Mantis. 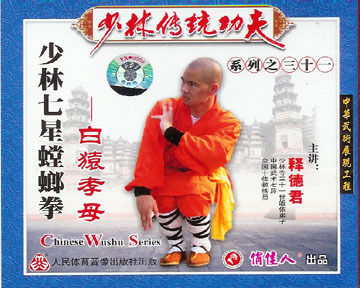 What we have here is a well-trained practitioner demonstrating what is called "Shaolin Mantis." There is no question of the clear and strong presentations of his form. However, given the history and theory of Mantis this style seems to almost revert more to Long Fist with some beautiful Mantis like poses. 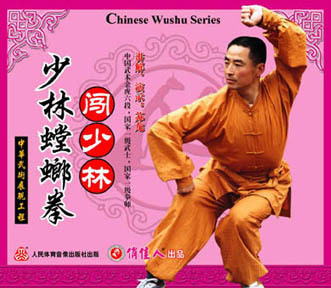 There is a slow fusion of contemporary training with traditional or near-traditional forms going on. We see this as a valid reinterpretation but not a fully evolved one. There are seventeen disks in this section any of which we will be happy to order. Our recommendation is, if you are really interested in Mantis, to order the survey and see if you enjoy this interpretation. This boxing is spreading in the area of Suxian, Hefei and Fengzhao of Anhui, Nanjing, Xuzhou, and Huaiyin of Jiangsu. Most of the other forms in this series are shown in demonstration without instruction. In Stock: NOT a special order item! 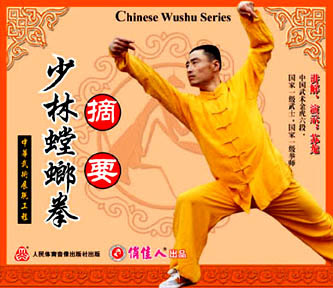 The basic skills of Shaolin Mantis are indispensable skill for exercising this style. Contents include basic styles of hand, stepping and legwork. Special Order. Originally called Four Harmonies/Six Chi's Hammer. This boxing is very simple and compact. 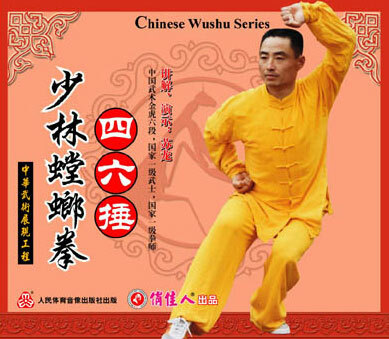 Its main methods of twisting and hitting, show the characteristics of Shaolin Mantis Boxing.Special Order. 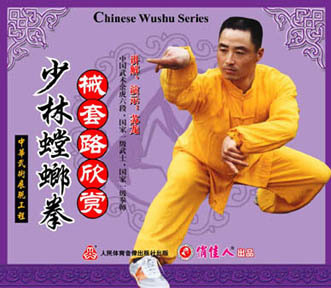 Beng Bu is considered the original boxing created by Wang Lang. This boxing is common to both Mei Hua and Seven Star Mantis. The method of hand of the Thrust Step Boxing is simple, nimble, with footwork adding power. shaking feet to add the power. Special Order. 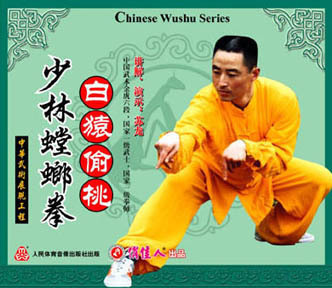 This is an important routine of Shaolin Mantis Boxing. It is also said to be a very early one. The goal of this boxing is to change hardness into softness which will, in later practice, subdue all hardness. Special Order. The "Summary Boxing" is an essential to learning Mantis skills. Often other forms are built around it. It shows many combinations and fundamental changes. 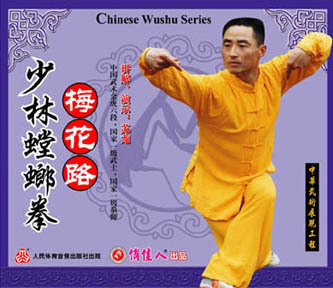 The movements are fast and graceful but the focus is on basic fighting skills. Special Order. This is another example of Mantis skills with multiple strikes and angular changes. Special Order. 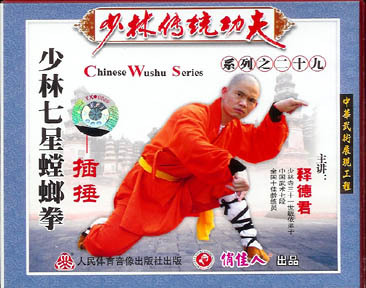 This is one of the main routines of Shaolin Mantis Boxing.It has steady footwork and a lot of typical Mantis movements such as cutting, chopping and warding off. The white ape steals peach is known for its characteristic speed with palm actions; its fast footwork changes and its angular attacks. Special Order. This form shows the firmness and strength of the style. 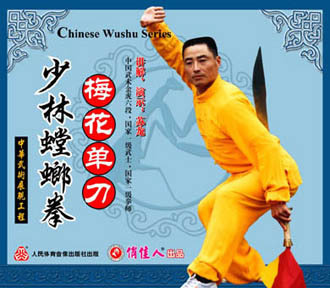 Its special skill relies on "bright" hands and "dark" legs which means hidden and off angle stepping. Special Order. This routine is particularly geared to chopping moves. Its method of hitting with attacking the higher part of body while the leg attacks the lower part of body. This shows the speciality of Mantis Boxing utilizings both hand and legs with simultaneous attacks. Special Order. 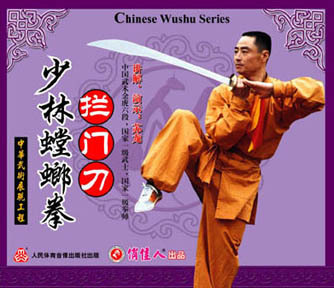 The plum-blossom broadsword is agile fast.The single broadsword needs both speed and firmness. The player should always assume he is fighting against a spear holder. Jumps and twirls are common in this weapon. Special Order. The spear should move like a Dragon and flash like the tongue of a snake. Main methods include: blocking, holding, pricking, lifting, warding off etc. Special Order. 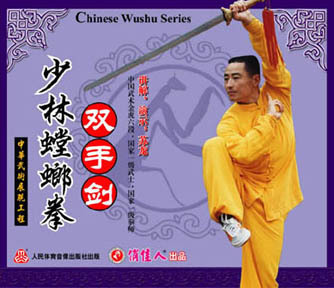 The straight sword if often associated with Mantis and one of the particular skills of the style realtes to the Two Handed use of that weapon. Much twisting and angular deviations with this characteristic weapon. Special Order. The Saber is famous for special attributes: quick as lightning, flashing like a meteor, and changeable as a tiger running. This set is known to some as "Big" Blocking Saber. It is said that the "Small" Blocking Saber has been lost. Special Order. The Arhat Hammer was created by Bai Jianmin, the master who combined Mantis and Arhat skills. Its movements are highly geared to attack and defense intermixing firmness with speed and changes. Special Order. This boxing is compact, extended, fierce, simple and nimble. 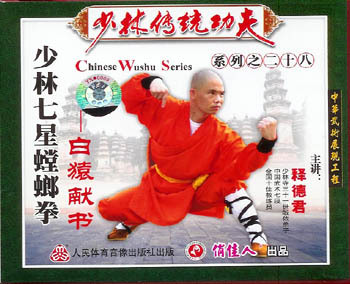 It represents of The Northern Long Fist of Shaolin Boxing.Special Order. This is a traditional boxing of Mantis school. shifting and kicking. The characteristic fighting skills are: receiving in side, hitting in front, defending upward, attacking downward, treat the retreating as defending, keep the attacking when defending. Special Order. Please contact us if you want any of these SPECIAL ORDER items. Special Orders usually only take about one week.